I always stumble over how much description to add. I have trouble getting all my thoughts from my outline into a nice smooth flow. This is where I am: trying to get that (fourth) draft into finished product, and putting together a package. Sounds like a great thing for me! I always have too many scenes in my outline and have trouble deciding if they need to be cut or reworked into another part of the storyline, plot or subplot. It's amazing that each writer has their own area that they struggle with. This book sounds like it provides a lot of the answers. What other writing books do you recommend that concentrate on finishing your book in a short time period? I have a detailed outline for the main plot but struggle when it comes to all the other little nuances or how much forshadowing to include. When is done...done? I keep reworking my first chapter...over and over again. This may be just the thing to help me with that dreaded "middle"! I'm loving all these comments I'm reading. We do all have our little areas that trip us up. A lot of these issues mentioned are dealt with in detail in FROM FIRST DRAFT TO FINISHED NOVEL and some of them are covered comprehensive in FIRST DRAFT IN 30 DAYS, which details how to write an outline so complete it actually qualifies as the first draft of your novel. Revision and goal-setting are touched on in that book. But FROM FIRST DRAFT TO FINISHED NOVEL really takes over where FIRST DRAFT IN 30 DAYS leaves off and takes you from brainstorming to submission. The two work together perfectly and, between them, detail step-by-step every single aspect of writing a book. If you're not working in these stages so each one is separate and taking breaks in-between each stage, you'll lose focus and end up revising continuously because you're not allowing yourself time to refresh your perspective on the material. The point of working with an outline is that the clearer a writer’s vision of the story before the actual writing, the more fleshed out, cohesive, and solid the story will be once it makes it to manuscript format. But your outline doesn't have to include the actual tension or foreshadowing--it just needs to have a reminder to yourself that it needs to be included when you write the book. Remember, your outline is just one of many layers of your story. You’ll be expanding with every stage that follows—and that means most definitely that your story will grow and expand and take on richness and depth during the writing, revising and editing and polishing, too. It’s a major benefit of starting with an outline! When I sit down to write the book after completing a "first draft outline", I always know what’s going to happen in the story on a daily basis. This is not to say that the book doesn’t come to life, grow and flesh out more deeply and vividly as I write. It does immeasurably! Somehow that tension I knew needed to be in my outline is coming to life the way I wasn't able to write it before. Or sometimes I'll be revising a book and realize I need to add foreshadowing earlier. Because I took the story through every stage in the process with necessary breaks for the material, it really is like “birthing” the full-fledged book a layer at a time. If you miss one of those stages in completing a story, the book is actually missing a layer that would have made it more powerful and fleshed out. When you're working in stages, each step is a layer that’s added to the book--a layer that makes it stronger, richer, and more cohesive. Both of my books detail all of these things. In June, WOW will be posting an interview with me (along with their review of my latest WDB WRITING THE FICTION SERIES), so I hope all of you will come back then. I'm too intimidated to even start! That's my biggest problem! I can't manage my time. If I start writing about one idea and come back to it weeks later, I forget where I was going with it, think it stupid and just leave it to rot. In the final throws of editing my first manuscript. I need all the help I can get. I have trouble balancing dialogue and detail, among other things. Repetition is a big problem that I'm battling in my current project. Well, I'm writing my first novel, and I have to say, it's very addicting, and well, 68,000 words later, I'm still working on it, I guess you can say my first draft is done, now rewrites are in progress, and progress and progress, I'm just plain stuck in the middle, chuggin away at a snails pace. So, any help that comes my way would be FANTASTIC! Both look like good books. Thanks for having the contest. I seem to be a pantser, but I go nowhere with a story that way, so I need to be a plotter, but I really don't have the skills to be one. Very frustrating, since I know I can write and I have great ideas/plot bunnies. Somehow I have to get the words out of my head and onto the paper. I have trouble getting from the research of historical facts to the actual writing. My problems with my first draft is I'm too all over the place in how I write it, from character point of view to how I outline it. Some days I'm writing from the heart and it comes out in a nice flow, other days I can't find that flow and it comes out as if I'm explaining the story, rather then my characters living it. I need to find a right outline for my stories, one that works for me. My problem with first drafts? I don't outline, so the middle gets away from me. I find outlining almost impossible. I have written two first drafts during NANO months but I really flounder when it comes to revision. I get caught up in word choice and sentence structure and can't get to the bigger revisions. I need a step by step plan! Try setting a deadline for your research. Give yourself two weeks (or a month if your schedule allows it) or so prior to beginning your outline to do all the research you need. Or do your research over the course of a year or more. I have contracts out to 2018 and I'll buy books, etc. and start researching now for some of them so I'm ready to start outlining when the time comes. This might work for you. Good luck! I read a long time ago that a certain best-selling author always has more than one manuscript going at once. When he temporarily loses inspiration for one, he moves to another work-in-progress (WIP). Now, this is most definitely not the same thing as working in stages, which we discussed in my March column. This author abandons one story after the other, working on whatever inspires him at the time—maybe coming back to some of them later, maybe not. Jumping from project to project may be an effective way to work for some writers, but it can prevent you from making significant progress with any one project. At one point in my career I was juggling several ideas at a time, writing notes, starting stories—and not and not getting more than a few chapters written of each. Most writers can’t concentrate on more than one story at a time if they want to move forward steadily. New story ideas won’t distract you if they’re percolating gently on a back burner, but eventually, each of those ideas will brew to the point that they’re ready to be poured out on paper. This is natural—you want this to happen. But if you’re trying to make headway with one project when another suddenly commands your attention, you need to find a way to set the new idea aside and refocus your concentration on your current project. You can do this by writing out any notes you’ve brainstormed on the new idea and relegating the idea to its own project folder, which you can pick up and review at a more convenient time. By purging the idea to paper, you effectively exorcise it temporarily so you can concentrate fully on your current WIP. I have a separate folder for each of my story ideas in my story cupboard. If I need to purge an idea, I can pull out the folder for that story. Purging the idea is a quick process because my notes are usually only enough to fill a sticky note or a single sheet of paper. Occasionally, I do have to take a little more time to purge (a day or two) because the story has progressed fully to the pouring and puzzling out stage. The outline is forming rapidly in my head, and I have everything I need to put it together. Sometimes the only way to exorcise a particular story is to write down all the notes that come to me until I’m stalled or temporarily free of it. These go into the appropriate project folder. The story is then returned to the percolator, and I get back to my WIP. I think you're looking at the big picture when it comes to writing a book instead of taking it one step at a time. Using a step-by-step outlining method like the one I detail in FIRST DRAFT IN 30 DAYS (as well as the other aspects of writing a book included in FROM FIRST DRAFT TO FINISHED NOVEL) might help you a lot with your intimidation of starting a book. You do everything in clearly defined stages, so you shouldn't feel at all intimidated getting started. You're only doing one small part of the process at a time. In the outline, I'll actually include notes to myself: Karen, include a description of this character, or of this setting, etc. In the writing, I have to go back in my revision and include all the descriptive elements I missed while writing the first draft. Then I make sure they're smoothed out in the editing and polishing stage. Try these for writing dialogue and narrative. Your story may need another "spark" to enliven it and get it moving out of snail's pace in the middle stages. Check out FROM FIRST DRAFT TO FINISHED NOVEL to find out how to inject these periodically to keep the book rolling from start to finish. 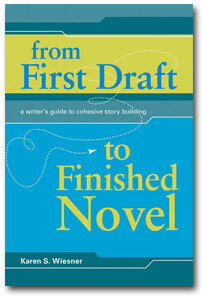 You sound just like I was before I came up with the outlining method in FIRST DRAFT IN 30 DAYS. I just didn't know how to get a good idea in story form. This book should help you immensely. Again, the step by step process brings the idea to fruition in a way nothing ever has for me. I hope it helps you. I get through the writing fine but editing is such a pain. I get half way through and give up sometimes. Not good. I am having a lot of trouble getting rid of "monkey mind" lately! I could really use the advice and the kick in the pants to start up writing and editing again. I tend to get stuck more on research and creating my story in my head and less pouring it out on paper. I really want it out of my head and struggle with cohesive flow even with the outline in place. I also tend to over analize every paragraph and edit as I go. I think this book may help with staying on track! The outline frees me to explore every aspect of a book—without risk. It allows my ideas (and my characters) to come to life on their own and grow. An outline is an absolutely ideal place to explore new characters and story threads. Use your outline to explore any angle you want. If new characters crop up, wonderful! Include them. If they’re not right for the story, getting rid of them won’t take you much time at all. Explore a new story thread—follow wherever it takes you. If it’s a logical thread, keep it. If it’s not, delete it. You’ll only lose a little time, and your story will be stronger for it. If you realize halfway through or even all the way through outlining a book that some of your ideas aren’t working, it’s just a matter of deleting the offensive scenes and starting again in a new direction. This is a change that probably won’t take longer than a few days to make (instead of the months or even years it might take to identify and correct a full draft of a novel created without an outline). When I was working on the outline for Until It’s Gone, the fifth book in my Wounded Warriors Series, after a period of about a week, I’d completed scene-drafting up to the final scenes in the book. It was then that I ran into problems because I was starting to see I had a secondary character playing a major role he didn’t fit in, and that my main plot thread wasn’t working the way I’d hoped it would. I spent a good amount of time brainstorming in different directions that would make the story stronger. Ultimately, I had to cut maybe two dozen scenes I’d already outlined—not the major problem it sounds, since everything around these scenes was good. The next day, I deleted the unworkable scenes from the story file on my computer, keeping a printout of them in case I needed something from them later. Then I started laying in my new story threads and getting down the groundwork for the revised role of the character in question. By the end of that day, I had the outline back to the same point I’d had it the day before—only now the story worked beautifully. The following day, I continued going over my outline, filling in with new ideas that fit the revised portions. The end of the book came together easily because the rest of the story now meshed. I lost only a day or two backtracking by deleting bad ideas and exploring new, stronger ideas. If I’d skipped the outline and gone directly to writing the book, I would have spent weeks, possibly longer, getting three-quarters of a 70,000-word-plus book written and then having to delete most of it because the story structure wasn’t strong enough. Endless pages would have been scrapped in a revision that would have reshaped most of the book from scratch. Exploring new angles, characters, and concepts while outlining allows you to avoid spending countless hours laboring and only then finding out these don’t work. Working the kinks out of a story within the outline is productivity in the ideal, and it’s within every writer’s grasp. The clearer a writer’s vision of the story before the actual writing, the more fleshed out, cohesive, and solid the story will be once it makes it to paper. Remember, your outline is just one of many layers of your story. You’ll be expanding with every stage that follows—and that means most definitely that your story will grow and expand and take on richness and depth during the writing, too. It’s a major benefit of starting with an outline! Try using story folders. That should help you a lot because you're simply writing down all your brainstorming without requiring "organization" of yourself. Once it's out and you have time to start working, you'll have all (or a lot) of your story puzzle pieces and it'll be easier for you to try to put them together in an outline or blueprint of some sort from that point. Good luck! I always have problems staying motivated. My mind wanders very very easily. I have trouble with making my plot points flow together well instead of seeming like, well, plot points. This sounds like a wonderful resource. I think I do fine with setting and details, but I worry about character building. Do I show enough? Are they realistic? This sounds like it could help smooth the storytelling process.